Successfully Added UltraFire E06 CREE XML T6 1000Lm Zoomable LED Flashlight Set - 5 Modes, 1 x Charger to your Shopping Cart. 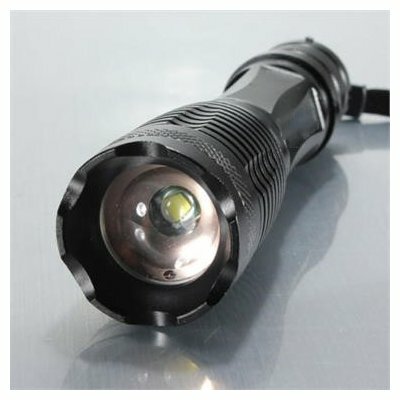 High Power Cree XPE LED Torch casts 1000 Lumens and comes with two rechargeable batteries and charger. This high powered CREE LED torch is made from a rugged aluminum alloy and comes with runs on a 18650mAh battery (not included), from a full charge it can light your way for up to 3 hours. It has a rubber seal for the base and charging port that provides reliance to the weather and the wrist strap and textured shaft ensure you won’t easily drop it. The torch comes with an independent battery charger and you also get a power adaptor that can plug directly into the handle of your torch so you can charge both batteries at once. The output of this torch is amplified by a convex lens so you can make the most of the 100 lumens Launch. Five modes (High-Middle-Low-Strobe-SOS) to choose from you can select high, low or strobe depending on your needs so whether you’re outdoors hiking and camping or just need some illumination for home repairs or changing a tire, this LED torch is ideal for all your needs. This product is in stock now, we guarantee next working day shipping and offer a 12 months warranty on all our products. Brought to you by the leader in electronic devices and wholesale LED flashlights Chinavasion.